Ronnie O`Shaughnessy has been involved in almost every aspect of Cork theatre for a considerable number of years, as actor, singer and musical director. As a musical performer she appeared with all the leading musical societies in Cork. She was musical director for the annual Pantomime and Summer Revels at the Opera House for over twenty years. Ronnie`s happiest memory is her introduction to the stage at St. Aloysius School production of a Gilbert and Sullivan Musical. Her teacher brought James N. Healy to rehearsals to give advice on extracting the best colour from the words and music. His advice was a wonderful aid for Ronnie to bring out nuances she had not even thought of . He came to the opening night of the show and offered Ronnie a role in his next production “The Mikado” thus starting her long career in Cork Theatre. Ronnie then appeared on stage in May 1951 in “Berkeley Square” with the Presentation Guild, acting the lead female to Dan Donovan`s lead male, directed by Der Breen and featuring Michael Twomey. By 1952, she was on the Opera House stage with the same group in “The Trial of Christ” with Abbey Scott and Bill Coughlan. While a member of the teaching staff of the Cork School of Music, Ronnie performed with the RTE Concert Orchestra and served as musical director for several Noel Pearson productions. As musical director for the Montfort Singers she conducted all their big musicals over the years like “West Side Story”, “Hello Dolly”, Camelot” and “Oklahoma”. Ronnie also appeared on stage in “Mame” and “The Music Man” for the Montfort Productions of those very successful shows reflecting her lifelong interest in acting. It is noteworthy and an example of her ability and different talents that, in 1988 for the Montfort Singers 25th Anniversary Production of “The Music Man,” she was on stage as Mrs. Paroo but was also the Choral Mistress for the show. So, it was no surprise that, when Summer Revels finished, Ronnie decided to return to her first love-the stage. She began a series of plays directed by the late Michael Twomey, R.I.P., including “The Heiress”, “The Constant Wife”, “An Ideal Husband”, “Lady Windermere`s Fan”, “An Inspector Calls” with Alf McCarthy in 2007, “Matchmake Me Do”, “Many Young Men of Twenty”, “The Field”, “Survivors” and “Up the Rebels” by Declan Hassett celebrating Cork G.A.A. Heritage. When Michael passed away last year, Ronnie felt it was time to bow out!! Playing Bridge has now taken over from her theatrical days. 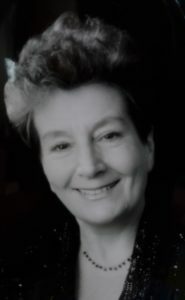 Ronnie O`Shaughnessy is a very worthy recipient of the Lord Mayor`s Heritage Award in recognition of her immense contribution to the Musical and Stage Heritage of the City.